Bob Harrington attended the March 1977 open house at Davis-Monthan AFB, and kindly shared his photographs that show Firebees and Firebee-related subjects. Starting with left outboard example, this appears to be an AQM-34K, judging from the camera window position. It features a special paint scheme, and it is probably not fly-worthy. The color looks like Insignia Blue (FS 15044), and it is marked with a 'not-exactly-a-sharkmouth' and eyes, '432 DRONE MAINT' on the mid fuselage, a TAC badge on the rear fuselage, and fake serial number '76-432/DM' on the tail (a AGM-45A Shrike serial number). It's likely that this is the same Firebee that is now on display at the Pima Air Museum. The left inboard Firebee is a standard AQM-34L as used by 22nd Tactical Drone Squadron in the reconnaissance role. Its serial number is 69-6062, and it has a non-standard light gray tail cone. The Firebee on the right inboard pylon is AQM-34M 70-1168 of the 22nd Tactical Drone Squadron. It has twin film camera reel bulges on the camera compartment cover, as fitted to most late AQM-34M's. The rear-left view shows the elevator indexer rod on the endplate nicely, almost full up here. On the right outboard pylon an AQM-34V as used by 11th Tactical Drone Squadron in the electronic warfare role was displayed. It had serial number 67-20420 (a rebuilt AQM-34H or J), and had black ALE-1 chaff dispensers fitted. Bob found three CH-3E's of the 432nd TDG. Pictured first is 65-5690 of the 11th TDS, with conventional 'AF 65-690' serial presentation. Projecting from the rear door is the Mid-Air Retrieval System (MARS) gear. Second is 63-9690 of 22nd TDS. Since a normal serial presentation would cause confusion with the previous CH-3E, it has the full serial 'AF 63-9690' painted on. Bob's third picture shows a unique detail view of the MARS gear installed in these CH-3's. The last CH-3E is 65-12788 of the 22nd TDS. Bob also took a bus tour of the base. This image of AQM-34K 67-(2)1638 was photographed as the bus zipped past a parked DC-130. This AQM-34K was likely used for flight training. The spine, wing tips, horizontal tail tips and endplates, and the vertical tail are all painted orange, which is rarely seen on AQM-34's. The sharkmouth concept is taken to new levels, complete with gills and a black fin painted on the vertical tail. These markings were later partly copied on the Pima AQM-34K. A peculiar detail is the 'reversed pitot tube' fitted to the right wing tip. During the afternoon before the open house, Bob spent some time under the approach to Davis-Monthan. He photographed DC-130A 57-0514 with a pair of AQM-34V's, both fitted with two black chaff pods. A very nice hot air balloon picture of the DM open house can be seen on Airliners.net. A detail view is shown below. Unfortunately, the DC-130 is not visible in the photo. Paul Dion, formerly with TAC's 4472nd Support Squadron (SPA) / 4453rd Combat Crew Training Wing, described the situation during his time (1970-1973): "If you look at the Titan missile on display (right side of the picture) and then look straight above that, you see two silverish hangars, the left one being the TAC drone area. There is a C-130 on the far edge of the hardstand in front of our hangar. This is where most of the TAC DM pictures were taken, usually looking toward Mt Lemmon, on the right horizon. 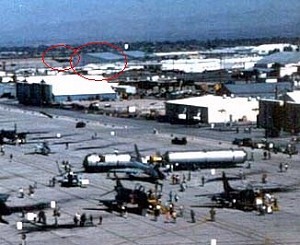 The SAC area was behind the camera and on the right edge of the flightline."